This campaign is set ten years after a previous set of adventures (HERE). This is the nineteenth session of the current campaign (Session 19 can be found HERE). After they killed the emperor and fled to a temporary haven, the party restored Niang the Demon Hunter's husband (he had been turned into a Yao servant). Heading further south they eventually heard news that Empress Xiaolongu selected Chun, her five year old nephew, as the next emperor. They agreed to split into three groups: Niang the Demon Hunter and her husband would go to Hu Qin and await any instructions from the party (she had pledged lifelong loyalty for their aid), the Purple Cavern Trio (Min, Long Shu and Lingsu) would go south to Purple Cavern Sect Headquarters to discuss the possibility of arranging a future marriage between Emperor Chun and Water Lily, while the remaining party members (Rong, Kang and Zhi Zhu) would return to Fan and investigate the matter of Bone Breaking Sect. On their way to fan they were stopped by soldiers searching for the emperor's assassins. The soldiers had wanted posters with their likenesses on them so they (the party) used their kung fu take them out. They then went to Fan where Zhi Zhu spied on the Senior Grand Councilor's residence. There she saw him interrogating a prisoner and asking about a message from Abbot Firebrand. Near the residence, at the statue of the Bold King, there was also a funeral for the King of Li Fan (who had died the same night as the emperor) and his son, Prince Yuan, vowed to march his army north against the capital, with the help of General Dee. Zhi Zhu saw the Senior Grand Councilor leave his residence and head north on a sedan chair (he didn't appear to make any attempt to attend the funeral). The party followed the senior grand councilor (who was traveling with 16 soldiers and two martial experts) then ambushed him outside the city. They managed to take out most of his soldiers quickly, but he burst from the sedan chair, creating a blast that wounded both his own men and the party. He put up a good fight, but they had the advantage due to the ambush and managed to kill him. Then they interrogated one of the martial heroes about the message. He told them that the Senior Grand Councilor had it on his person. Inspecting him they found a letter (presumably from Abbot Firebrand) warning that Lady Xiang (Bone Breaker's wife) had gone to Heaven Palace Sect and that her people were well on the way to the Face of Vaagu*. Zhi Zhu went back to the Senior Grand Councilor's residence and stole papers from one of his chambers. She also found the prisoner, whose feet had been cut off, and offered to help him. The man was persuaded of Zhi Zhu's good intentions. She asked about the message and who it was for. He simply told her that if she met a man named Kang that he should track down the Senior Grand Councilor because he had a message for him. He asked for his wine gourd and when he drank from it, he died (it seemed he had willingly poisoned himself). Zhi Zhu then returned to the party just outside of town at their boat. Knowing they needed to get to the Kushen Basin quickly to stop Bone Breaking Sect, they had Zhi Zhu go into town and look for a Kushen or Kailin Tribesman. She found a Kushen gambling for hands over a game of Go. The tribesman won and his opponent's hand was cut off. As he enjoyed a victory drink and feast, Zhi Zhu offered to pay him if he took her party across the mountains to the Face of Vaagu. He agreed to meet the rest of the party and Kang negotiated a rate of 1 silver tael per day or 1 gold tael on any days they run into trouble and he lends a hand. The Kushen agreed and told them his name was Togu. They made their way west through Li Fan but came upon some headless ghosts in a forest. The fight was actually quite grueling as many of their Kung Fu techniques didn't seem to work well against them. Only the Wind Saber and Bone Breaking Stick (as well as Togu's Rope Dart) appeared to have any impact on the ghosts. 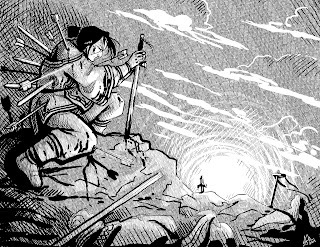 When they dispatched the ghosts they continued west through the mountains and found there way to the Face of Vaagu (Togu remained on the periphery of the area, not wanting to enter Kailin territory). The Face of Vaagu is a great stone head that appeared on a tall narrow spire of rock in the middle of the Kushen Basin. When they got there, there was shattered stone all around the base and the face was gone. Going to the nearby cave city of Khazel (the seat of Prince Gol and Princess Samga). Because they know her and because he had sent Nuan (his disciple) to aid the Kailin, Kang asked the locals how to reach the prince. He found the people were all afflicted with a terrible plague, and that the heaviest losses were among the tribes' warriors. At the palace of Prince Gol he learned that Princess Samga was also ill from the plague and he found Nuan heavily scarred and wounded from battle. She told him they had missed the Bone Breaking Sect by eight days, and that she was one of the few people able to fight. When Bone Breaking Sect arrived they ushered in a plague that immediately affected all their warriors. 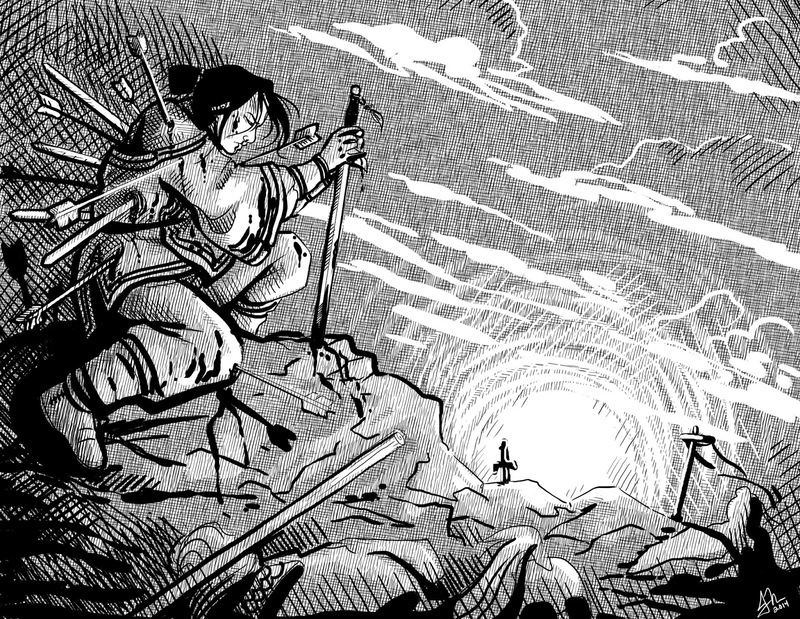 She mentioned that they had a great martial expert named Hu Gao, whose power was unlike anything she had seen. Kang thanked Nuan and managed to speak with Princess Samga in private. She was gracious and appreciated Nuan's help. She gave Kang the Belt of Hooshal, an important relic of their tribe to aid him in recovering the Face of Vaagu. Taking Nuan with them, the party returned to Togu and headed back through he mountains. Togu was able to find the trail of Bone Breaking Sect and agreed to help them retake the face. The trail led to a place called Bone Kingdom, a vast expanse of bone surrounding a stony mesa with caves and a fortress on top. This was apparently the headquarters of Bone Breaking Sect as well as the dwelling place of the Sisters of Pure Phoenix Sect (who lived in caves at the base of the mesa). Zhi Zhu scouted and found signs that the statue had been taken up to the fortress. She also saw strange birdlike creatures leaving one of the caves in flocks, at regular intervals. They would circle the area and return. The party decided to approach the fortress. This is the where the session ended. *Bone Breaking Sect was involved in a plot to "Invert Heaven" by restoring the Demon Emperor and dethrone the Enlightened Goddess. Part of this plan required the Face of Vaagu (a gate to Infinite Sky Realm) so its powers could be used to help the open the seal that imprisons the Demon Emperor in Yao Gong. They also needed the Heart of Yao Feng (which Kang possessed) and the Key of Yao Feng (which was located at Red Mountain Villa under the protection of the Five Immortals).